In the world of industrial and technical textiles, laser cutters are often the only choice for high production speeds on difficult materials. There are two main advanatages to laser cutters over blade cutters. Laser cutters do not touch the fabric. This means that many types of difficult material can be easily cut without problems which could lead to waste or ruined fabric. Laser cutters can edge seal fabric while it is being cut. The edge seal will stop fraying and can eliminate a hemming or separate edge-sealing operation. Aeronaut manufactures two ranges of innovative gantry-mounted laser cutters with either a lightweight chassis or a heavier dual gantry chassis for carrying larger, heavier lasers. The Elektron Laser Z and Elektron Laser ZT are single gantry cutters able to carry lasers up to 100 watts output, air or water cooled. They are light-weight machines and therefore move quickly and smoothly, giving clean, accurate cuts. This class of light machines is especially suited to cutting light fabrics such as parachute and spinnaker Nylon or smaller details such as are found in paraglider foils where a heavier high power laser either can’t accelerate fast enough to be productive or has more power than required for light fabric. Of course these cutters can be run at lower speeds for cutting multiple layers and thicker material. The Elektron Laser ZX is a heavier dual gantry chassis and can carry heavyweight lasers from 100 watts power and upwards. 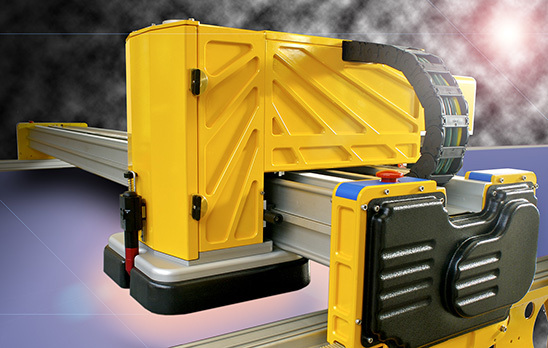 The dual gantry is fitted with precision linear bearings for a long, accurate life. While the maximum speed of the Elektron Laser ZX is similar to that of Aeronaut’s lightweight lasers, it does not accelerate as rapidly and is not as suitable for work on light fabrics or small patterns. 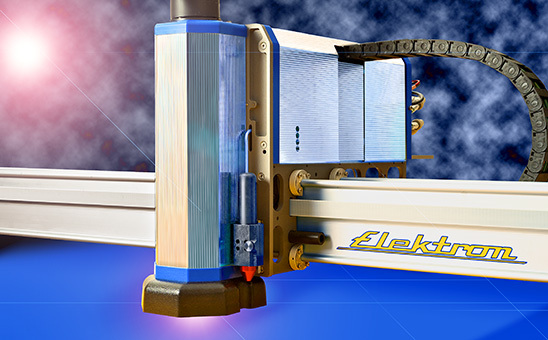 The Elektron Laser ZX is perfect where high power cutting is needed on materials like sailcloth, insulation materials, non-wovens and other synthetics. All machines are fitted with modern so-called “all metal” CO2 lasers. The all-metal tag means that the only non-metal part of the laser is the output window where the laser beam exits. This type of laser is very rugged, very reliable and offers a long service life. The service life of a laser is normally taken as being when the output power of the laser falls by 10% below its rated power. This is normally caused by the laser gas leaking from the tube. Typically this service life rating is greater than 45,000 hours. Of course the laser can still be used, with cut speeds a little slower. Bt normally the laser tube is simply re-gassed, which is a fairly low-cost operation, and power goes back up to 100%. The Elektron Laser ZX is available in a Duo version which incorporates a blade cutting head integral with the laser head. The cutter takes Cam-lock tools and can carry any tool in the Aeronaut range of Cam-lock quick change tools.